President Bush will nominate Samuel Alito to the Supreme Court, rebounding from a stinging rebuke over his first choice by tapping a conservative federal judge to replace retiring Justice Sandra Day O’Connor, a moderate. Bush plans to announce the nomination at 8 a.m. EST, two senior Republican officials said Monday. The White House hopes the choice mends a rift in the Republican Party caused by his failed nomination of Harriet Miers, and puts his troubled presidency on a path to political recovery. But Democrats already put the White House on notice that a conservative judge such as Alito would create problems. Miers bowed out last Thursday after three weeks of bruising criticism from members of Bush’s own party who argued that the Texas lawyer and loyal Bush confidant had thin credentials on constitutional law and no proven record as a judicial conservative. The officials, speaking on condition of anonymity because they were not authorized to preview Bush’s remarks, said Alito was virtually certain to get the nod from the moment Miers backed out. The 55-year-old jurist was Bush’s favorite choice of the judges in the last set of deliberations but he settled instead on someone outside what he calls the “judicial monastery,” the officials said. Bush believes that Alito has not only the right experience and conservative ideology for the job, but he also has a temperament suited to building consensus on the court. A former prosecutor, Alito has experience off the bench that factored into Bush’s thinking, the officials said. So consistently conservative, Alito has been dubbed “Scalito” or “Scalia-lite” by some lawyers because his judicial philosophy invites comparisons to Supreme Court Justice Antonin Scalia. But while Scalia is outspoken and is known to badger lawyers, Alito is polite, reserved and even-tempered. Alito was born in Trenton, New Jersey. He graduated from Princeton University with an A.B. in 1972, and went to Yale Law School, where he earned a J.D. in 1975. From 1981 to 1985 he was assistant to Solicitor General Rex E. Lee, and was deputy assistant to the Attorney General Edwin Meese from 1985 to 1987. After a brief stint as U.S. Attorney for the district of New Jersey, he was nominated by George H. W. Bush in 1990 to the United States Court of Appeals for the Third Circuit. His chambers are in Newark, New Jersey. Former U.S. attorney; some liberals have dubbed him “Scalito” or “Scalia lite” for his similarly conservative views and pointedly written rulings. Women’s rights groups point to a Pennsylvania law he voted to uphold requiring women to tell their husbands before having an abortion. The Supreme Court struck down the law in 1992. Alito wrote the opinion for ACLU v. Schundler (1999), holding that a holiday display on city property did not violate the Establishment Clause because it included secular symbols, such as a large plastic Santa Claus, in addition to religious symbols. A dissenting opinion in Planned Parenthood v. Casey, 947 F.2d 682 (3d Cir. 1991), arguing that a Pennsylvania law that required women seeking abortions to inform their husbands should have been upheld. 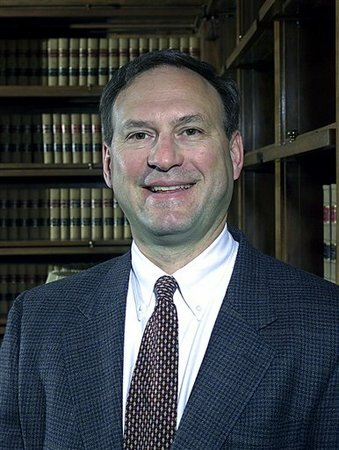 As Judge Alito reasoned, “[t]he Pennsylvania legislature could have rationally believed that some married women are initially inclined to obtain an abortion without their husbands’ knowledge because of perceived problems--such as economic constraints, future plans, or the husbands’ previously expressed opposition--that may be obviated by discussion prior to the abortion.” Chief Justice Rehnquist’s dissent from the Supreme Court’s 5-4 [corrected] decision striking down the spousal notification provision of the law quoted Judge Alito’s dissent and expressed support for Judge Alito’s reasoning. Alito’s conservative stripes are equally evident in criminal law. Lawrence Lustberg, a New Jersey criminal defense lawyer who has known Alito since 1981 and tried cases before him on the Third Circuit, describes him as “an activist conservatist judge” who is tough on crime and narrowly construes prisoners’ and criminals’ rights. “He’s very prosecutorial from the bench. He has looked to be creative in his conservatism, which is, I think, as much a Rehnquist as a Scalia trait,” Lustberg says.